For nine-year-old Mikah Tobaben, variety is the name of the game. From spending time with his family and friends to competing in world-renowned sporting events, Mikah does a little bit of everything to ensure he doesn't miss out on life's pleasures. "He definitely has a lot of interests," Mikah's father, Dan, said of his son. "Every day is a new adventure for him. He just loves experiencing life." With so many interests, Mikah, of Columbus Township, Mich., who has spinal muscular atrophy, has a lot of ground to cover. He uses a Q6 Edge® Power Chair from Quantum Rehab® to explore life's possibilities. "With the Q6 Edge, Mikah doesn't miss out on any of the fun of being young," Dan said. "It lets him get out into the world and see what it's all about." The Q6 Edge helps Mikah get around indoors and out. The chair's speed allows him to get from place to place in a timely manner, and it handles different kinds of terrain well. "With the Edge, Mikah can go where he wants when he wants," Dan said. 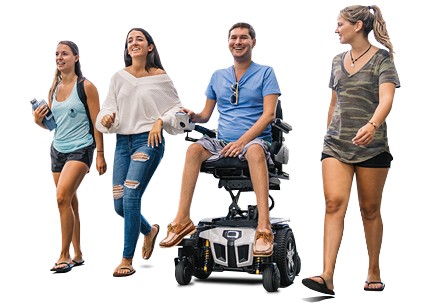 "Whether he's going outside and cruising or staying inside and going from room to room, it makes getting around much easier." 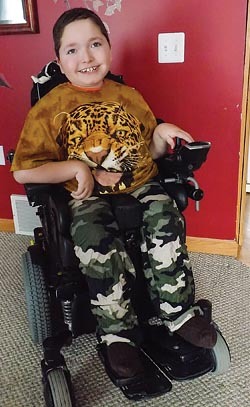 Though he feels at home playing video games or spending time on his computer, Mikah is also active in sports, having competed in the Special Olympics multiple times. Mikah likes working with computers because he can control them easily using his tablet. His interest in computers carries over to school as well. "If you asked him what his favorite subject in school is, he'd probably say it was lunch," Dan said. "But in all seriousness, he seems to enjoy his technology classes the most." Dan says that the Q6 Edge also makes it easier for Mikah to get to and from school and get around while he is there. "Mikah loves the Edge's speed, but since he is seated most of the day, comfort is also important to him," Dan said. "And he finds the Edge very comfortable." Dan and his wife, Shaylee, have always encouraged Mikah in his ambitions. "No matter where he goes, we're always right there with him, either physically or in spirit," Dan said. "Like any parents, we just wish for our son to be happy." As far as Dan can tell, their wish has been granted. Mikah is living his life to the fullest. "He knows what he likes, but he's always open to new experiences," Dan said. "That's Mikah's edge."